Eczema is a red or gray skin changes, which are often accompanied by irreversible itching and cannot be easily remedied. With this we will give you some great tips on how to treat fungal skin infections in the natural way. Swelling of the skin, changes in color, itching and dryness of the skin usually indicate a fungal infection, known to the people as eczema. Although there is a fungal skin infection in the background of this problem, there are some other dermatological diseases that have a similar clinical picture, which is why doctors are reluctant to use this term. These changes in skin can also be caused by psoriasis, chronic lichen simplex (known as neurodermatitis) and many other skin diseases. Pets are also sometimes the source of this infection. Skin lesions are best treated if the therapy is carried out both from the outside and from the inside, and certain medicinal plants can be of great help in the treatment of this dermatological disease, which we will talk about later on. Fungi normally live on our skin and with them we are constantly in touch through various objects from the immediate environment. Fungal skin infections usually occur due to immunodeficiency, physical exhaustion, irregular nutrition, lack of vitamins and minerals. Damage to the skin and mucous membranes then becomes the place where they inhabit and reproduce causing uncomfortable skin changes. Symptoms of fungal infection usually appear as red or gray scaly circles anywhere on the body, especially on the face, hands, shoulders and thighs, as well as rupture of rounded areas. Eczema on the head is recognized as an area without hair, which is burned and peeled. It is necessary to differentiate the fungal infection of the skin from the one also affects the nails (read more in the text fungus on the nails). Also, it is very important to differentiate skin lesions and infections that involve places with hair, because in this case the therapy is longer. Most often, fungal infection on the skin of the body begins with oval redness that begins peripherally to spread, has excessive edges and sometimes sheds. 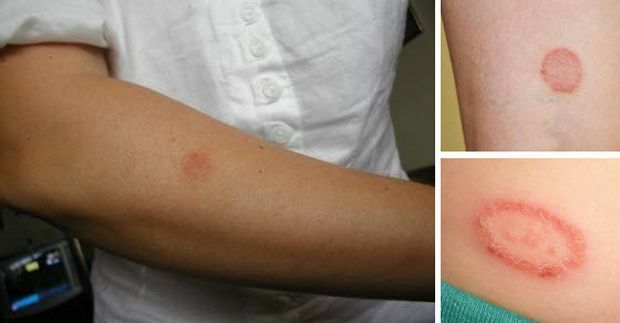 The special form of this disease, pityriasis versicolor, is seen in the form of oval, light-brown and reddish stains on the skin of body and arm. In order to diagnose lesions on the skin other than a clinical examination, an important role is played by mycological examination (it is taken from a change in the skin and tests on fungi), and sometimes it is necessary to take cutaneous biopsies of the skin. If it is a persistent fungal infection of the skin, it is necessary to introduce certain corrections in the diet, in order to strengthen the immunity and reduce the acidity of the organism, and thus cure the infection - the spots on the skin. Foods that favor the growth of fungi are sugar, yeast, white flour, alcohol, all fermented products, mushrooms, but also other foods that increase the body's acidity, such as meat, meat products, eggs, milk products (except kefir and probiotic yogurt) all industrial products containing preservatives, emulsifiers and sugar. We also need to treat it from the inside with lemon, fresh vegetables, and cloves, as well as raw almonds, oregano oil, garlic, and some proven supplements for strengthening the immunity, including propolis drops, Echinacea, silver water and various herbal teas. Although there are many products on the market today, medicine and creams against fungus on the skin, we will not talk about all of them but this time we will offer you only natural methods of treatment, so let's start in line. If there is some fungal infection on your face it can be a big problem so try the next simple recipe. Apply fresh strawberry juice on your face in the form of face mask before bedtime, and after 20 minutes, wash off with water. The therapy is repeated for 7 days. Two spoonfuls of chopped mint leaves, a flower of marigold and the root of dandelion and celery and put everything in a liter of olive oil. Keep the bottle closed and stored for about 5 weeks in a warm place. Use it for lubricating the affected area, which has been previously cleaned with tea from the chamomile. The oil of hyssop works well on the facial skin and helps in the treatment of skin lesions. It is used so that a few drops of this oil are mixed with soy oil and applied to the affected site. Squish the green peel from young walnuts until you get porridge that is applied on the skin four times a day, until eczema disappears. Plantain - 30 g of fresh leaves wash and then chop and then put in a bottle and poured with 120 ml of olive oil. The oil should completely cover the leaves. Let it stand in the sun for 40 days, then strain through the thick cloth and pour in the dark glass bottle.. This product is applied on the affected skin area. Pick and chop the two handfuls of marigold (flowers, leaves and stems). Half a kilogram of high-quality pork (and fat) can be placed in a medium-sized bowl and warmed up to boiling. Into heated fat insert the chopped bride and leave it to boil again, and then stir it up and remove it from the heat. Cover the dish and leave it overnight at room temperature. The next day, the mixture should only be warmed up a little so that it can be processed. Pour the grease into the appropriate bowl and lubricate the diseased skin, several times a day, until improvement. It is used to suppress various skin diseases and mucous membranes, and is applied externally and internally. However, as it is a very strong substance, the use of apple vinegar with diluted water is recommended for the treatment of fungal infection of the skin. It is recommended that you do not use the usual vinegar as it may cause the reproduction of fungi. Apple vinegar is useful for the eczema of the scalp, and in that case it is also recommended to use walnut oil. Dermatologists point out that excessive use of soap and water, as well as some other more aggressive hygiene and care products, as well as peeling of skin, destroys its natural flora and increases the preference for a skin eczema. After each shower, moisturizing cream, milk or natural oil should be applied to the skin in order to create a protective layer. Chemical products containing preservatives and scents should be avoided, and priority should be given to natural products, which are increasingly available on our market. You can also make a mixture of olive and linseed oil, water and some salt, and thus treat the skin with it after showering. Those with excessive sweating problems need to change clothes more often, because wet and irritated skin is the perfect for formation of these problems. We recommend that you read the following texts: fungi of nails, seborrheic dermatitis, oily skin of the face and many others.